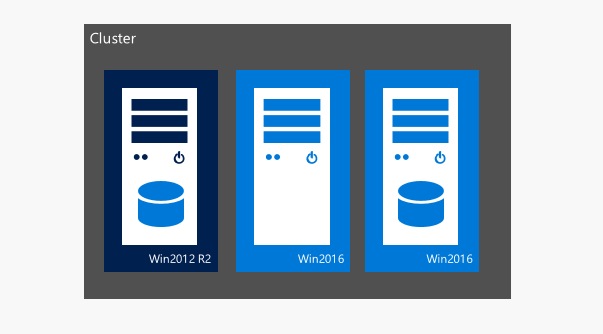 Finally, I’d like to review what’s new in failover clustering in Windows Server 2016. Actually, I wrote this article a couple of months ago for Russian official Microsoft blog so if you are Russian you can go to this resource to read it in your native language. Also, I described some of the new features before RTM-version (when only TPs were available) and almost all of them can be applied to Windows Server 2016 as well. It means there are no significant changes in RTM for them. I’ll provide a short description of such features and links to my previous posts with a detailed information. Cluster migration is usually a headache for administrators. It could be the reason of huge downtime (because we need to evict some nodes from old cluster, build the new one based on these nodes or new hardware and migrate roles from source cluster. So, in the case of overcommitment we won’t have enough resources to run migrated VMs). It’s critical for CSPs and other customers that have implemented SLA policy. Windows Server 2016 fixes this by adding possibility to place Windows Server 2012 R2 and Windows Server 2016 nodes in the same cluster during upgrade/migration phase. In-Place OS upgrade is supported BUT Clean OS install is highly recommended. Use In-Place upgrading carefully and always check logs/services before adding node back to cluster. Hint: get list of supported VM’s version by host (Get-VMHostSupportedVersion). Failover cluster in Windows Server 2012 R2 can be deployed with an external disk or file share witness which must be available for each cluster nodes and it’s needed as a source of extra vote. As you may know, witness is highly recommended (I’d say it’s required!) for Windows Server 2012 R2 cluster regardless of a number nodes in it (dynamic quorum automatically decides when to use witness). 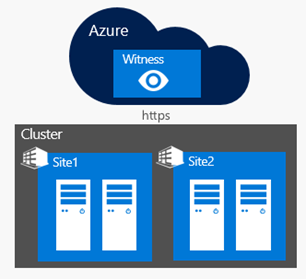 In Windows Server 2016 a new witness type has been introduced – Cloud Witness. Yes, it’s Azure-based and it’s specially created for DR-scenarios, Workgroup/Multi-Domain cluster (will be described later), guest clusters and clusters without shared storage between nodes. Cloud Witness uses Azure Storage resources (Azure Blog Storage through HTTPS protocol. HTTPS port should be opened on all cluster nodes) for read/write operations. Same storage account can be used for different clusters because Azure creates a blob-file generated for each cluster with unique IDs. These blob-files are kept in msft-cloud-witness container and require just KBs of storage. So, costs are minimal and Cloud Witness can be simply used as a third site (“arbitration’) in stretched clusters and DR solutions. WS 2016 Datacenter Edition for highly virtualized private and hybrid cloud environments. 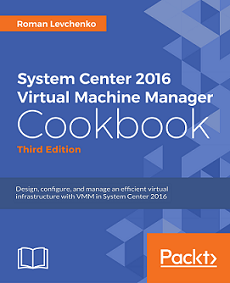 WS 2016 Standard Edition for non-virtualized or lightly virtualized environments. Other editions will also be available with more information coming in 2016. Standard Edition provides rights for up to 2 OSEs or Hyper-V containers when all physical cores in the server are licensed. Multiple licenses can be assigned to the same cores for additional OSEs or Hyper-V containers. Each user and/or device accessing a licensed Windows Server Standard or Datacenter edition requires a Windows Server CAL. Each Window Server CAL allows access to multiple licenses Windows Servers.